At over 7,500 feet (2,200m), Val Thorens is the highest holiday ski resort in the Alps and offers guaranteed ski-to-door accommodation. Along with Meribel and Courchevel it forms the famous Trois Vallées ski area. Val Thorens is a fairly unattractive purpose-built holiday resort, but its exceptional snow reliability and wide choice of skiing makes it hard to beat for the ski enthusiast. 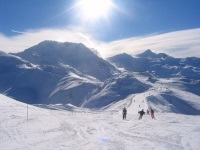 The Trois Vallées ski area is one of the best and most extensive in the world (10 times larger than Vail, the largest ski resort in the States), and Val Thorens offers some of the best skiing in the area. It's possible to ski through Meribel to Courchevel for lunch and back within a day, but check the lift times before setting off. The Funitel des 3 Vallées is a lift designed to transport skiers between Val Thorens and the rest of Les Trois Vallées. The slopes are high and mostly north facing, so there's likely to be a good covering of snow well into spring. There are a wide variety of slopes for beginners and intermediates and some challenging slopes for more advanced skiers higher up, including the Cime de Caron, a steep descent from the top cable car. Val Thorens also offers access to some excellent off-piste options, the descents towards Lac du Lou being the most famous. Even the most experienced skiers and snowboarders should hire a guide when going off-piste, both for safety and to find the best snow. While not exactly a major shopping destination, Val Thorens does offer holidaymakers a variety of good ski shops and plenty of provisions are available for self-caterers. There is a wide choice of restaurants in Val Thorens catering for most wallets and holidaymakers' tastes. There are also some good mountain restaurants and it's easy to ski over to Meribel for lunch. As always it's best to take local advice and book ahead for the better restaurants. The nightlife in Val Thorens is more limited than in the larger resorts, but there are still a few discos and plenty of lively bars. The clientele are less likely to be English than in neighbouring Meribel. For whiteout days holidaymakers can enjoy cinema, bowling, ice skating, a gym and an indoor swimming pool. Parasailing can also be arranged. Val Thorens is also home to the highest toboggan run in Europe. Due to its height and north-facing location, Val Thorens can be cold and bleak and has less off-slope activities on offer than many resorts.